Craig Johnson's The Highwayman and An Obvious Fact are now available from Viking. Ten years ago, Craig Johnson wrote his first short story, the Hillerman Award–winning “Old Indian Trick.” This was one of the earliest appearances of the sheriff who would go on to star in Johnson’s bestselling, award-winning novels and the hit television series Longmire, now streaming on Netflix. Each Christmas Eve thereafter, fans rejoiced when Johnson sent out a new short story featuring an episode in Walt’s life that doesn’t appear in the novels; over the years, many have asked why they can’t buy the stories in book form. 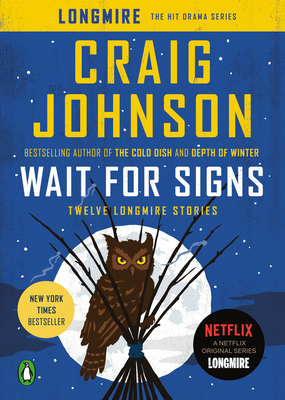 Wait for Signs gives Longmire fans a chance to own these beloved stories—and one that was published for the first time in the Viking edition—in a single volume. With glimpses of Walt’s past from the incident in “Ministerial Aide,” when the sheriff is mistaken for a deity, to the hilarious “Messenger,” where the majority of the action takes place in a Porta-Potty, Wait for Signs is a necessary addition to any Longmire fan’s shelf and a wonderful way to introduce new readers to the fictional world of Absaroka County, Wyoming.